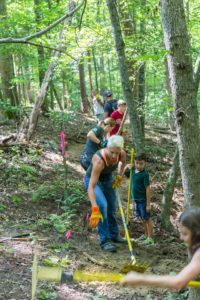 Trail Maintenance and Trail Building is the easiest method in giving back to the trails! Yes; materials, tools, and equipment require monetary resources through donation, but YOUR sweat equity has the greatest impacts. Additionally, it just makes you feel good to contribute to something that we all use and is within our local community. Every time that you go by the area that you may have worked; you will feel proud! Volunteers are what makes all this happen and only through them is how we move forward in the enhancement of the local trails. The definition of a volunteer is a person who donates his or her time or efforts for a cause or organization without being paid. Although cash money isn’t being received, we get “paid” knowing that everyone now and into the future can use these local gems. Hope to see you out on the next work day!